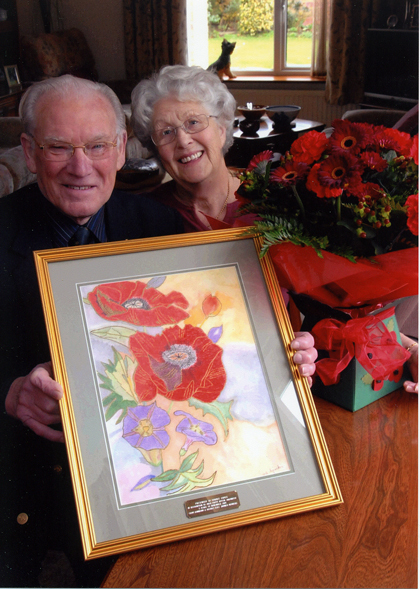 At the RBL Supper Dance last night held at the Town Hall, Downham Market, Mr.Horace Cross was presented with an original picture of poppies as a thank you to him for organising the Poppy Appeal for the past 5 years. In a short Speech the president of the RBL, Mr. Ivan Sneezum, praised Horaces devotion to this worthy cause.. His wife, Evelyn, was presented with a bouquet of flowers by Rose Gidney the Branch Secretary, in recognition of her fortitude and tolerance during the disruption in their lives during the weeks involved. And Arthur Muir made them very happy giving a bottle! It was announced this year that in excess of £25.000 was raised this year during Poppy Appeal.